Is a Black Hairy Tongue a Problem? A black hairy tongue sounds like something really scary - but it's not! It is totally harmless. It is NOT the result of anything bad, and it will not CAUSE anything bad to happen. As the name indicates, black hairy tongue has 2 components - black (ie. a dark color) and hairy (ie. a "furry" texture). The dark color comes from dark things you eat and drink, such as coffee and tea, and red wine, and maybe the spice turmeric in hot foods, and also from smoking. The "hairy" bit comes from an overgrowth of the tiny buds on the surface of your tongue. But this overgrowth is not anything like a tumor. It's caused by the little buds on your tongue surface not getting worn down as much as normal. They are usually worn down through normal eating and chewing. If you have a very soft diet without much fiber, then this wearing down process doesn't happen, and the buds (also called "papillae") tend to gradually get longer. This is also called furry tongue, when there's no dark color. Occasionally, a black hairy tongue can be caused by a bacteria or yeast infection, although this is less common. -So what can you do about it? Here are a couple of suggestions that should get rid of black hairy tongue over 7 - 10 days. Obviously, you need to deal with the causes of the condition! Try to reduce the amount of black coffee and black tea you drink, and try to sip plain water through the day. Stop smoking; or at least try to cut down as much as you can! Avoid all brightly colored foods, such as curry sauce, chilli sauce, chocolate anything, and red wine. Try to eat more things with a high fiber content, such as vegetables and wholemeal (brown) bread. Avoid cheese. Brush your tongue gently, in the morning after breakfast, and last thing before going to bed. By cutting down on the highly colored foods and drinks, the dark color on your tongue will start to fade. The most important things to cut out (at least for a few days) are smoking, black coffee and red wine. By trying to eat foods with some fiber in them, you will be restoring that low-level "abrasion" that our mouths are evolved for, and need, to rub off old cells and keep the papillae on the tongue a normal size. Brushing your tongue might seem strange if you have not done it before. The simplest way is with your normal toothbrush. After you have slowly brushed around all your teeth, (concentrating on the gums), spit out any excess toothpaste. Then stick your tongue out a bit, and brush the top of your tongue from the back towards the tip. Just put the brush on the back of your tongue, and drag it forwards towards the tip. Rinse your brush off under running water every 2 or 3 strokes. Do this for about 30 seconds. Don't worry if you don't get all the dark color off straight away. It's going to take a few days! Most importantly, don't scrub your tongue - you'll only irritate it or even cause an abrasion ulcer. You can also do this with an electric toothbrush, but switch off the brush first! The one exception to this advice is if you have a Cybersonic 3 sonic tooth brush. This has a tongue cleaner that clips into the handle, so that the tongue cleaning attachment is also active while you clean your tongue. You can also treat black hairy tongue with the TheraBreath Starter Kit, which includes a tongue cleaner. 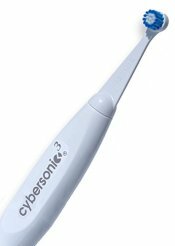 I recommend getting this kit in addition to the Cybersonic 3 toothbrush. This combination is THE BEST method of getting rid of a black hairy tongue! So a black hairy tongue is really a furry tongue with extra staining. It's a lifestyle issue. It's telling you that you need to cut down on junk food, and cut down on smoking, black coffee and / or red wine! Instead, you need to start drinking plain water through the day, and start choosing foods with some fiber. Maybe start off with a high-fiber breakfast cereal. For a snack, try a muesli bar instead of a donut. These changes will also be good for your general health, so there's no reason to delay.Make the decision to change your lifestyle today!